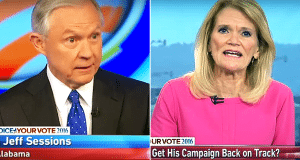 Senator Jeff Sessions performed admirably as he faced off against Martha Raddatz on ABC “News” program “This Week.” As is now expected, her approach and the content of the questions were clearly intended to damage Donald Trump, quoting the anti-Trump, pro-Clinton faux news publications, the New York Times and Time magazine as she attempts to belittle and diminish the Republican candidate. She leads with the NYT story, saying that there are 20 Republicans, advisors to Donald Trump who are close to him and have confessed to the known enemies at the New York Times their frustrations that Trump is not as manageable as they had hoped he would be. Asked about whether he believes the New York Times story is fiction, Senator Sessions says he doesn’t know, he hasn’t read it. What he does know is that the Trump campaign “is not over. The American people want change. They know we’re on the wrong track and I believe the American people are right in that regard.” As he continues to speak he reads her body language as she tries to steer the conversation away from substance and back towards anti-Trump sensationalism. Sessions calls her on it, saying, “Now you want to change the subject I know, and I want to tell you why I think he can still win and have a very good chance of winning and that’s because the issues are what the American people believe in and he’s right and they’re right. She says, “And I do want to talk about the issues but I do want to go back to this conflict that is being reported.” She wants to talk about the issues some day, maybe, but right now she’s only got a limited amount of time and her job at ABC is to bash Trump. She takes Senator Sessions back to the familiar DC molehills. It’s like Mr. Trump said, he could be Hillary Clinton handily if she were the only opponent. The media is against him too, the thought controllers and opinion guiders for millions of people incapable of thinking for themselves or successfully conditioned not to. Trump is simply telling the truth and exposing what the dishonest media is doing. 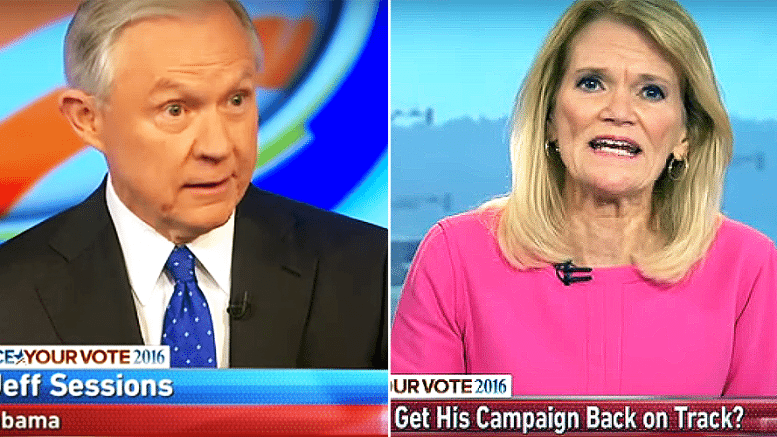 Raddatz, her employer, the New York Times and Time and so many others are members of the anti-Trump establishment. They have no intention of playing fair or reporting objectively. Their job is to get Hillary Clinton elected and finish off the United States, once and for all.